In genomic fields, it’s very common to explore the gene expression profile of one or a list of genes involved in a pathway of interest. 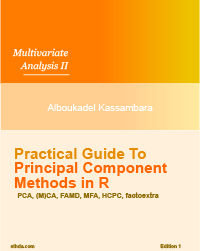 Here, we present some helper functions in the ggpubr R package to facilitate exploratory data analysis (EDA) for life scientists. 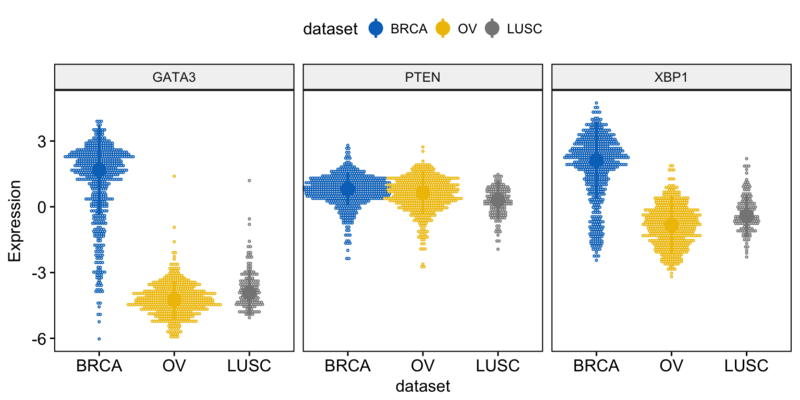 All these plots can be created using the ggplot2 R package, which is highly flexible. 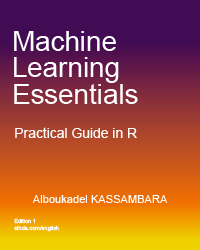 However, to customize a ggplot, the syntax might appear opaque for a beginner and this raises the level of difficulty for researchers with no advanced R programming skills. Here, we present the ggpubr package, a wrapper around ggplot2, which provides some easy-to-use functions for creating ‘ggplot2’- based publication ready plots. 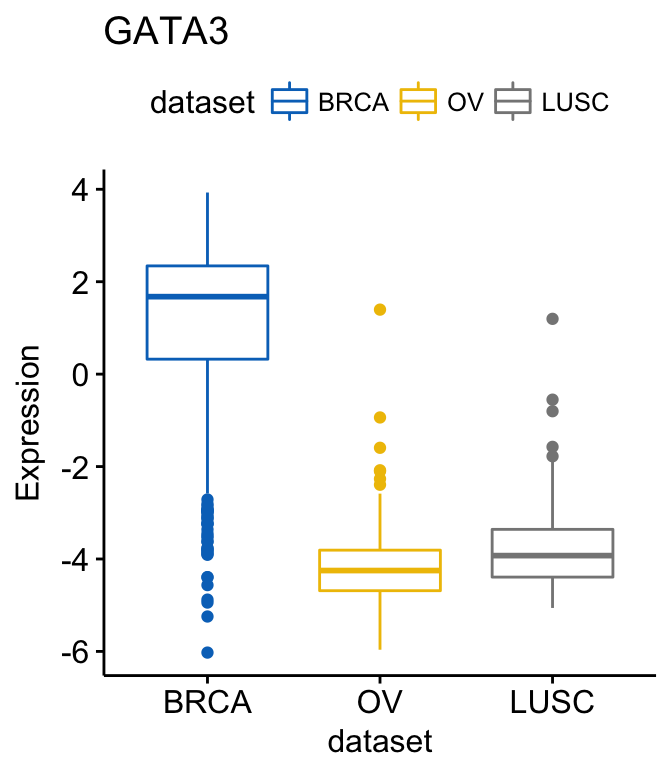 We’ll use the ggpubr functions to visualize gene expression profile from TCGA genomic data sets. 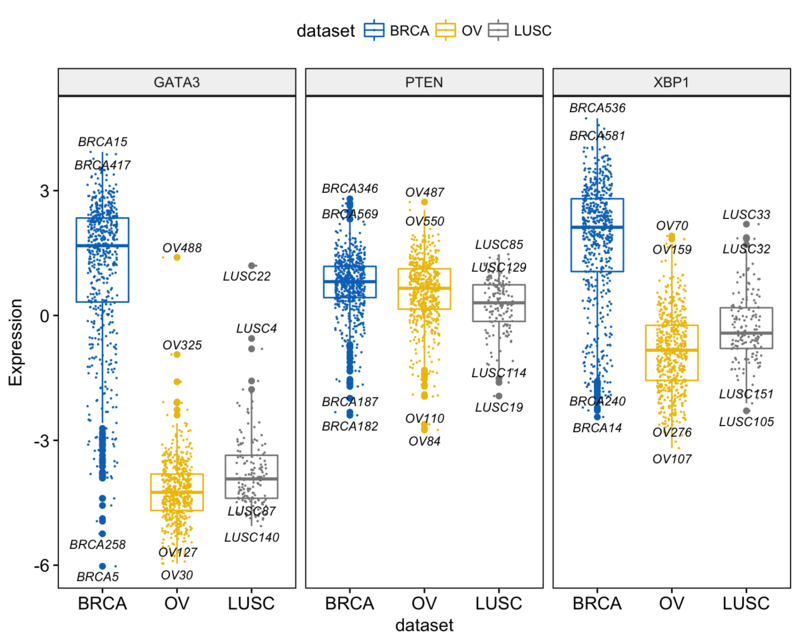 The Cancer Genome Atlas (TCGA) data is a publicly available data containing clinical and genomic data across 33 cancer types. These data include gene expression, CNV profiling, SNP genotyping, DNA methylation, miRNA profiling, exome sequencing, and other types of data. 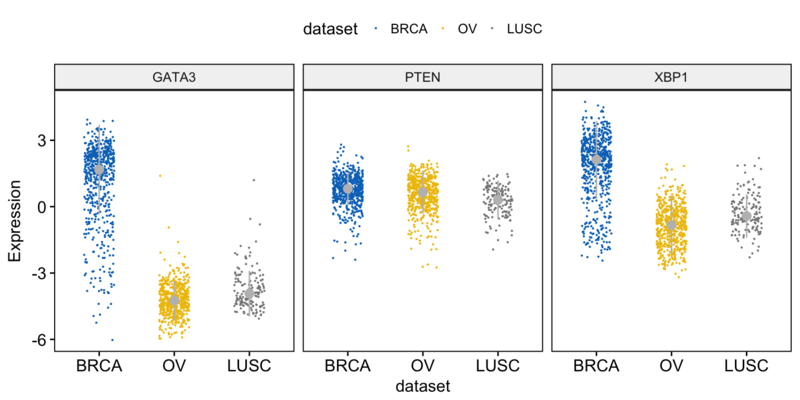 The RTCGA R package, by Marcin Marcin Kosinski et al., provides a convenient solution to access to clinical and genomic data available in TCGA. Each of the data packages is a separate package, and must be installed (once) individually. 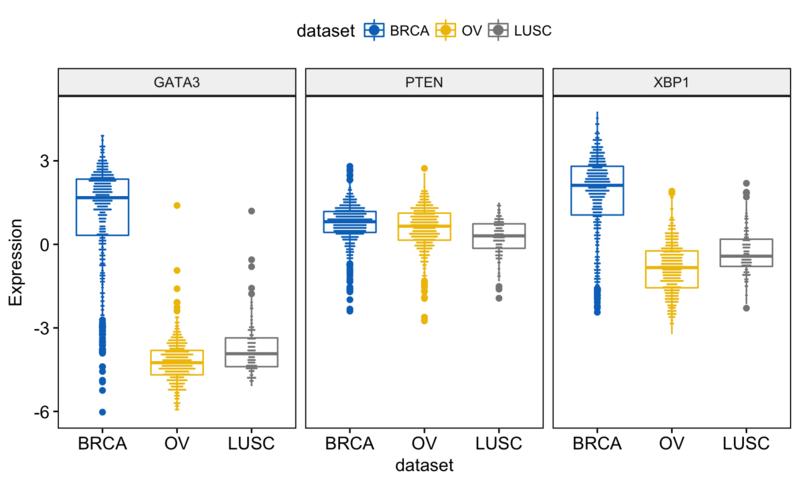 The following R code installs the core RTCGA package as well as the clinical and mRNA gene expression data packages. # Load the bioconductor installer. 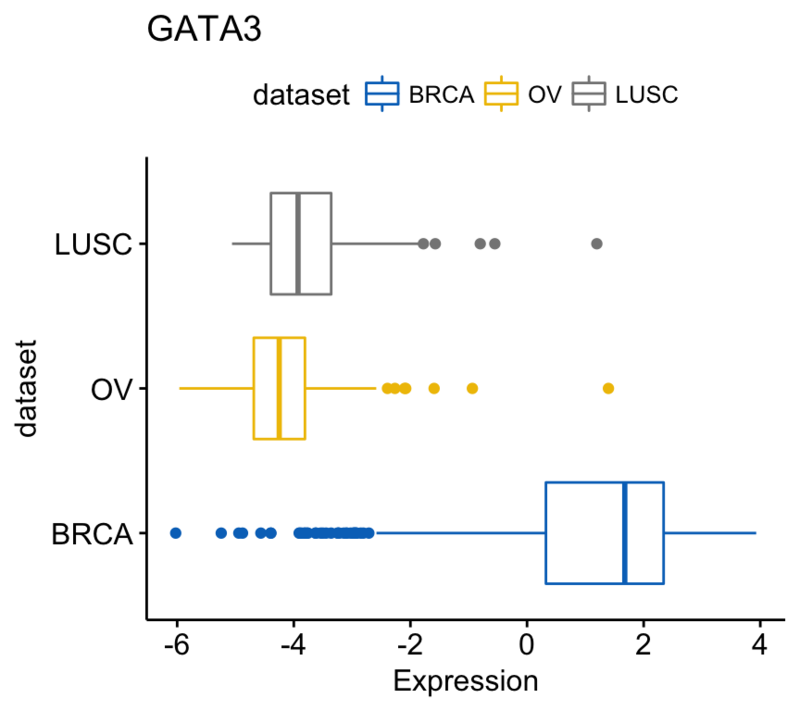 The R function expressionsTCGA() [in RTCGA package] can be used to easily extract the expression values of genes of interest in one or multiple cancer types. 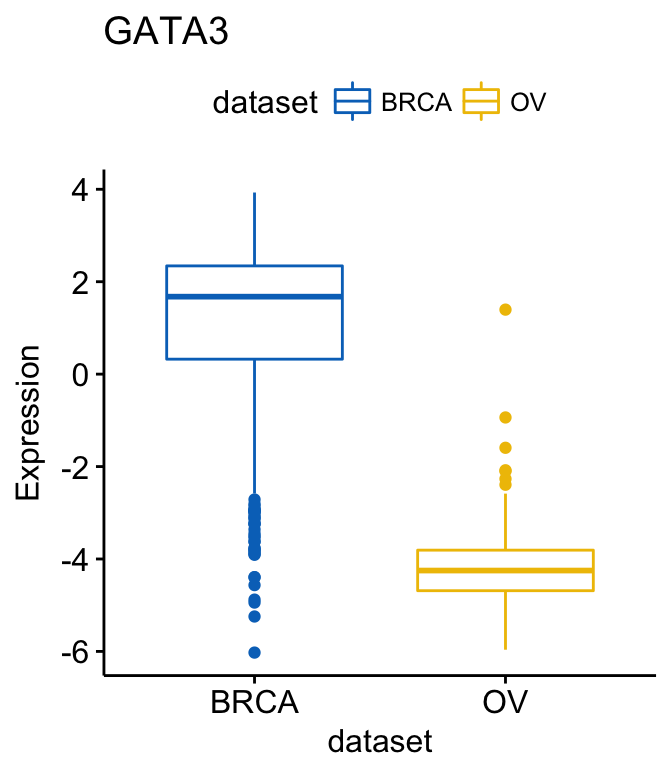 We can simplify data set names by removing the “mRNA” tag. This can be done using the R base function gsub(). The above (expr) dataset has been saved at https://raw.githubusercontent.com/kassambara/data/master/expr_tcga.txt. 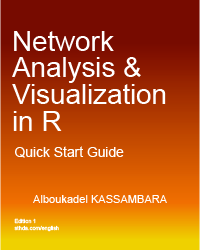 This data is required to practice the R code provided in this tutotial. and scientific journal palettes from the ggsci R package, e.g. : “npg”, “aaas”, “lancet”, “jco”, “ucscgb”, “uchicago”, “simpsons” and “rickandmorty”. Note that, when the argument y contains multiple variables (here multiple gene names), then the arguments title, xlab and ylab can be also a character vector of same length as y. 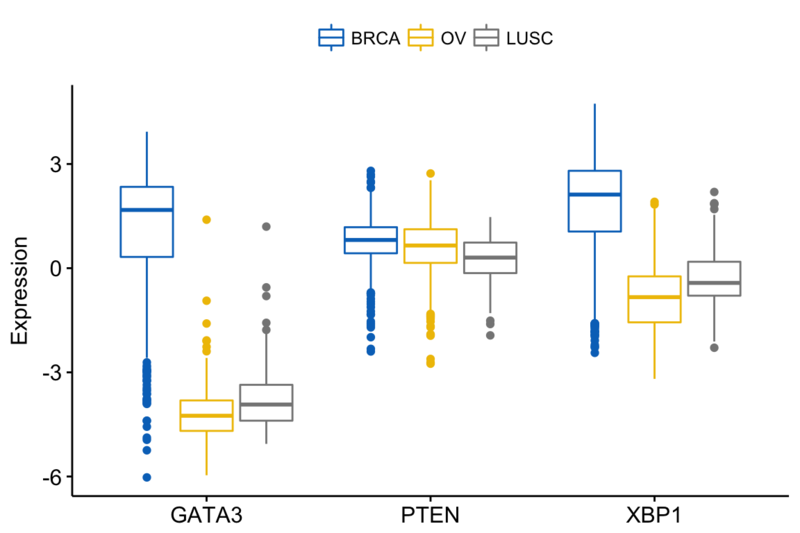 In the plot above, It’s easy to visually compare the expression level of the different genes in each cancer type. 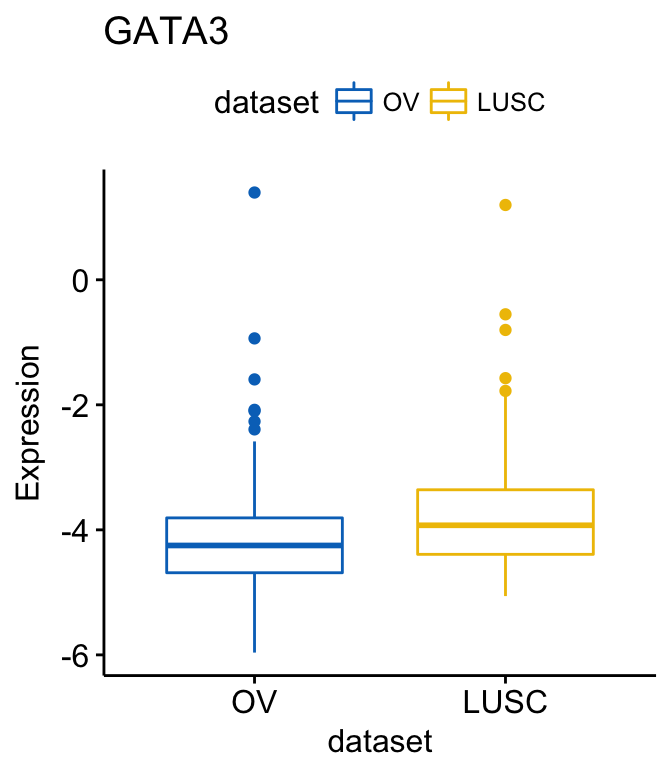 But you might want to put genes (y variables) on x axis, in order to compare the expression level in the different cell subpopulations. In this situation, the y variables (i.e. 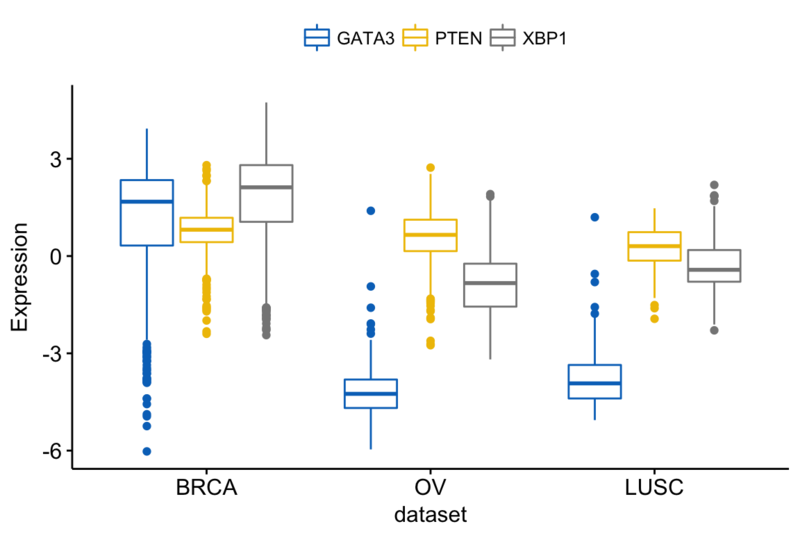 : genes) become x tick labels and the x variable (i.e. 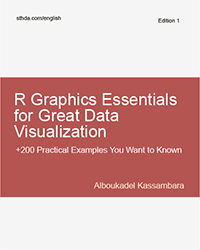 : dataset) becomes the grouping variable. To do this, use the argument merge = “flip”. 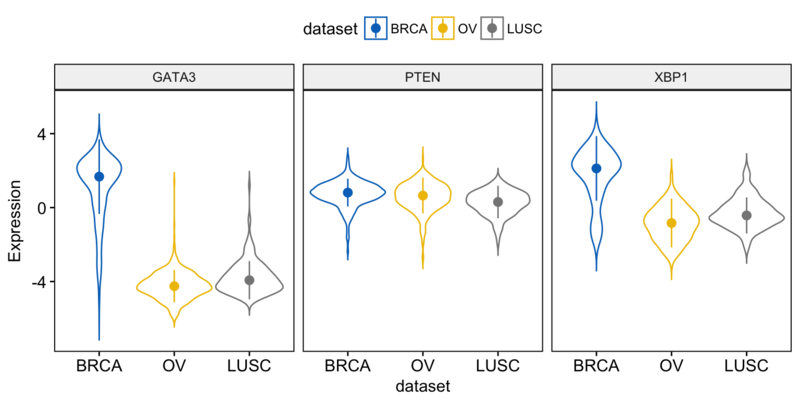 You might want to add jittered points on the boxplot. Each point correspond to individual observations. To add jittered points, use the argument add = “jitter” as follow. To customize the added elements, specify the argument add.params. 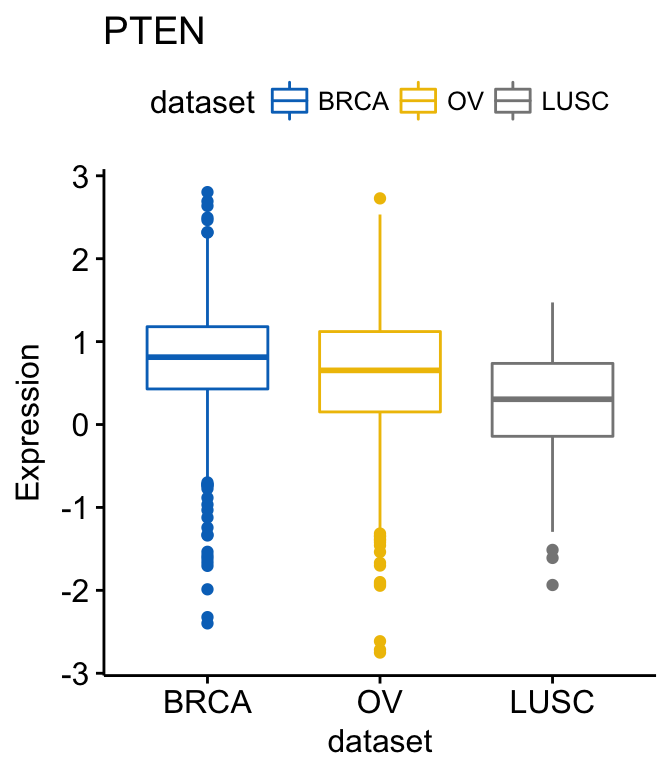 Note that, when using ggboxplot() sensible values for the argument add are one of c(“jitter”, “dotplot”). If you decide to use add = “dotplot”, you can adjust dotsize and binwidth wen you have a strong dense dotplot. Read more about binwidth. label: the name of the column containing point labels. a character vector specifying some labels to show. top.up and top.down: to display the labels of the top up/down points. For example, label.select = list(top.up = 10, top.down = 4). 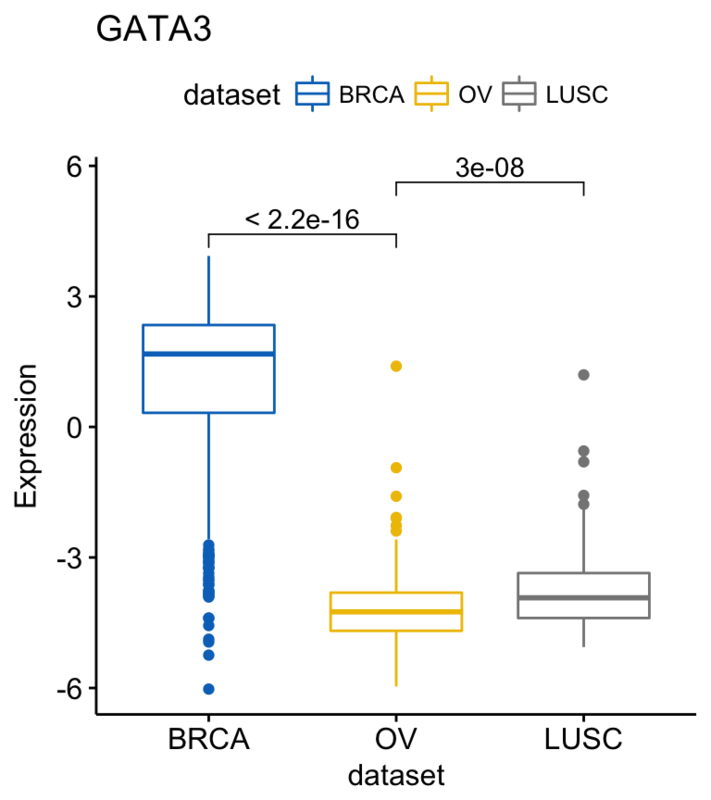 criteria: to filter, for example, by x and y variables values, use this: label.select = list(criteria = “`y` > 3.9 & `y` < 5 & `x` %in% c(‘BRCA’, ‘OV’)”). Other types of plots, with the same arguments as the function ggboxplot(), are available, such as stripchart and violin plots. When using the function ggviolin(), sensible values for the argument add include: “mean”, “mean_se”, “mean_sd”, “mean_ci”, “mean_range”, “median”, “median_iqr”, “median_mad”, “median_range”. 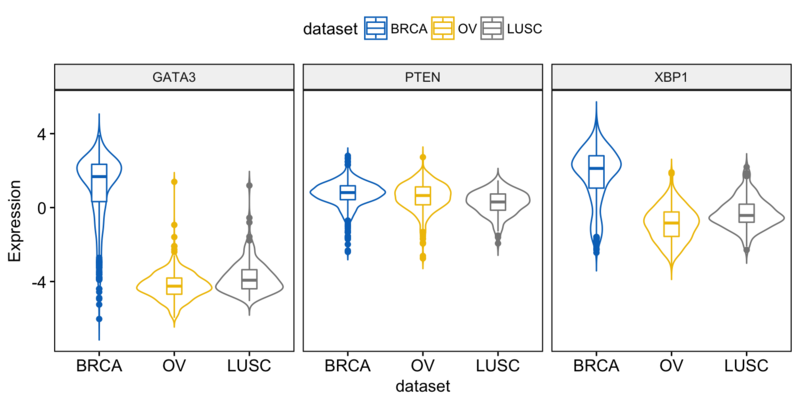 You can also add “jitter” points and “dotplot” inside the violin plot as described previously in the box plot section. add = "median",                  # Add median line. # and use y = "..count.." instead of "..density.."
xlab = "Expression", ylab = "F(expression)"
color = "dataset", palette = "jco"
color = ".x. ", palette = "jco"
Hi, first I thank you so much for this very usefull package. I don't understand why the lines go beyond the highest values, and the same with add="median_iqr". is it possible to do this with other cancer types as well? 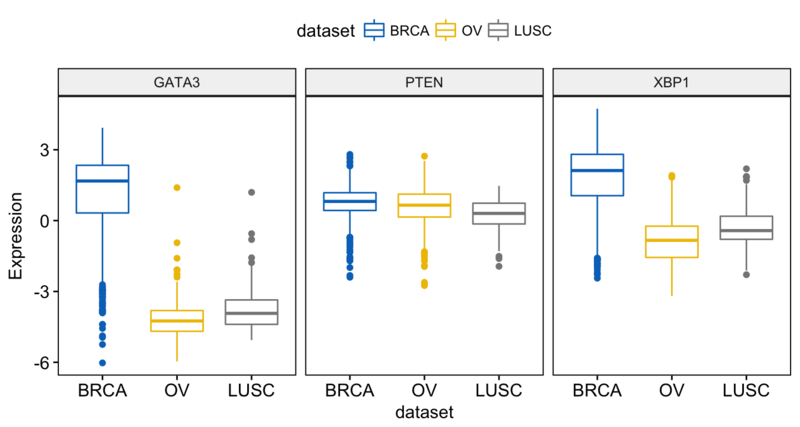 In the list it says there are counts for all cancer types but I cannot extract the expression from other cancer types apart from the ones you used here. How can I change the names of Y1 and Y2 and the font size? Thanks a lot for the nice solution. I don't know how to reply my previous comment. My working data structure is little bit different than this example, that's why I still facing some problem. 1) But I want the order like wt,mut_1,mut_2 or in another case I want to change the time order 4, 0 , 8 and cell order mut_1 , wt and mut_2. For that what do I have to write? Sorry for such long post. 1) Reorder the data set. 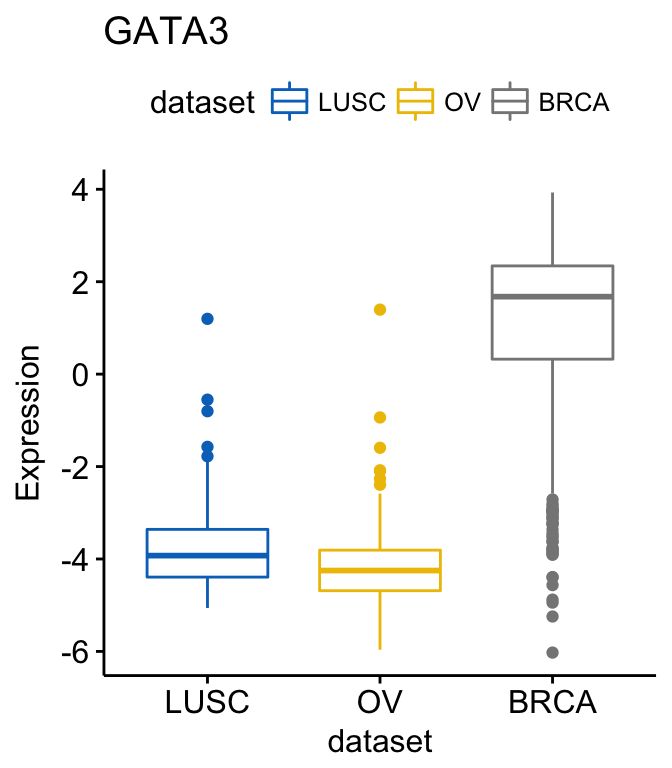 New order: LUSC OV BRCA. 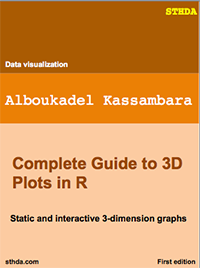 Thanks a lot for the nice blogs to teach people data visualization. For a newbie like me this is a huge treasure. 1. If I want to swap the position of BRCA OV LUSC what I have to add ? for example I want LUSC OV BRCA order or LUSC BRCA OV this order. What will be the code or how to modify the following code ?